Mission Blue founder Dr. Sylvia Earle and seven others were honored at a gala event at the Smithsonian National Portrait Gallery and American Art Museum. Awash in hues of blues and greens, the gallery reverberated with haunting tones emitted by Earth Harp. Elizabeth Broun, Director of the Smithsonian American Art Museum and Kim Sajet, Director of the National Portrait Gallery gave the welcoming remarks. Ms. Sajet’s profound statement saying, “we all come into this world alone and leave it alone, and it’s what we do in between that gives our lives meaning…” set the tone for the evening. UNEP Executive Director and UN Under-Secretary-General, Achim Steiner, gave an engaging opening address and stated that, “The UN’s flagship environmental award Champions of the Earth recognizes outstanding environmental leaders, thinkers and achievers who have stood up to be counted, often challenging the status quo, to usher a greener future.” He then announced that UN Secretary-General Ban Ki-moon would be the evening’s keynote speaker as the room erupted in applause. Palauan President Tommy Remengesau, Jr. – a friend and fellow OceanElder of Dr. Earle – was recognized as a Champion of the Earth with the Policy Leadership Award for his pioneering green economy policies that have strengthened the country’s resilience both financially and environmentally. Earlier this year President Remengesau declared the world’s first nationwide marine sanctuary to protect over 80% of Palau’s exclusive economic zone – an area of 600,000 square kilometers. This sanctuary prohibits commercial and foreign fishing while supporting a sustainable domestic fishing zone. Steiner praised President Remengesau’s achievements as reflecting “the level of commitment many Small Island Developing States demonstrated earlier this year to [advance] national sustainable development goals at the Third International Conference on Small Island Developing States through the S.A.M.O.A Pathway Outcome Document.” President Remengesau acknowledged his family and friends from Palau and called upon the rest of us to tap into our ocean origins as shepherds of our ocean and planet. The Policy Leadership Award also went to Former President of Indonesia, Susilo Bambang Yudhoyono, for becoming the first president of a major developing country to volunteer to reduce carbon emissions. His example shows other politicians that they can gain economic prosperity from a platform of environmental conservation. The Champion of the Earth for Entrepreneurial Vision was awarded to the U.S. Green Building Council, and CEO Rick Fedrizzi, who gave an engaging high-energy speech and described the many benefits his organization is realizing for the health of our planet by altering how living spaces are designed, constructed and used. UN Secretary-General Ban Ki-moon then took the stage and underlined the importance of UNEP and the role it plays within the UN. He echoed the underlying theme of the evening of advocating responsible behavior by the current generation in order to safeguard a healthy planet for generations to come. Sir Robert Watson received the Science and Innovation award for his exemplary work in promoting the science behind ozone depletion and climate change. As one of the world’s most accomplished climate scientists, Watson has been a key player in the Intergovernmental Panel on Climate Change reports, the Millennium Ecosystem Assessment, the International Scientific Assessment of Stratospheric Ozone and has testified before Congress multiple times regarding environmental issues. 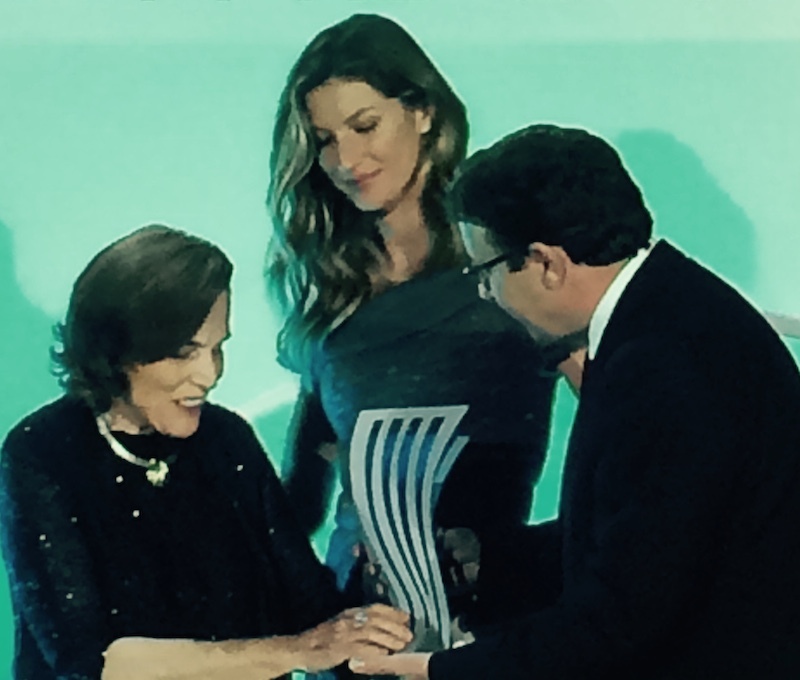 Gisele Bündchen – UNEP Goodwill Ambassador – presented the Champions of the Earth Award for Inspiration and Action to Boyan Slat and Fatima Jama Jibrell. Boyan Slat, founder of the Ocean Clean-up Initiative, won for his breakthroughs in working to solve the issue of plastic pollution in the ocean. At only 19 years of age, Slat is an entrepreneur determined to rid the ocean of plastics. His youthful exuberance accepting his award was tempered by his eloquence and determination. His design for The Ocean Cleanup Array made him one of Intel’s 20 Most Promising Young Entrepreneurs Worldwide. Boyan accepted his award with pleasure and vowed to continue his work until he completes his mission of solving plastic pollution. To mark the tenth anniversary of Champions of the Earth, UNEP presented two special Lifetime Achievement Awards. The first went to Nobel Laureate Mario Molina for his remarkable work in spearheading the research that led to a substantial restoration of the ozone layer and the discontinued use of chlorofluorocarbon gases (CFCs). “Thanks to the groundbreaking scientific research of Mr. Molina and his peers,” said Steiner, “the use of CFCs has been phased out, ultimately preventing adverse impacts on human health, agriculture, animals, forests, marine life, and natural ecosystems through the signing of The Vienna Convention and its Montreal Protocol – the first and only global environmental treaty to achieve universal ratification.” This protocol is considered one of the most significant climate-related global agreements ever made. Past laureates include Mikhail Gorbachev, Al Gore, Felipe Calderon, Mohamed Nasheed, Marina Silva and Vinod Khosla. Learn more about the UNEP Champions of the Earth awards HERE.